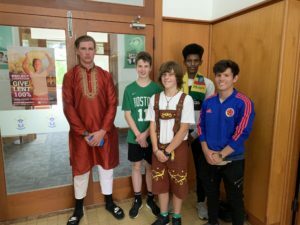 Last Friday St Edmund’s has its annual Cultural clothes day raising valuable funds for Project Compassion (Caritas). 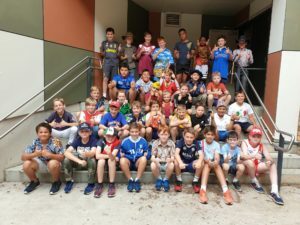 The boys learnt about individual stories from around the world in house groups, prayed regularly for people around the world that are facing hardship. Please read Lenten reflection taken from the Caritas website that shares some understanding of Salma’s story. The readings today draw us into a sense of rejuvenation and realignment with our baptismal call to participate in building the reign of God in our own time. In the first reading the prophet Isaiah tells us that God is doing a “new deed” amongst us, reminding us of God’s constancy in doing great things for us. In the response to the psalm we acknowledge that the “Lord has done great things for us and we are filled with joy.” It is this joy and sense of purpose that frames the Project Compassion story this week. We first met Salma as a very young mother, she was part of the Safe Motherhood program in Bangladesh, in 2013. Now in 2019, she is the mother of two young children. Prior to the introduction of the Safe Motherhood Program, young mothers like Salma struggled with a lack of support, and the overwhelming cost to visit doctors a long way from home. Many of the doctors encouraged these young mothers to have operations to give birth and this was in most cases unnecessary, frightening and prohibitively expensive. When the program began in 2013, this was a “new deed” in the lives of young families in rural Bangladesh. The training given to village and rural midwives has resulted in a most significant reduction in maternal deaths and other birth related complications. There has been a significant decrease in domestic violence due to inclusion of fathers in raising awareness of the shared nature of parenthood. Newborn infants are now less likely to be underweight in the early days of life and the improved nutrition of mothers during pregnancy is resulting in better health for both baby and mother. The actions of Jesus in the gospel today point to a liberating kindness where there is a suspension of the old ways of judgement and condemnation at the hands of power. Salma and her community have witnessed this liberating kindness in the changed arena of safe childbirth. The kindness and generosity of Caritas donors in Australia have contributed to a liberation from fear and exploitation around the sanctity of safe childbirth and confident parenting.